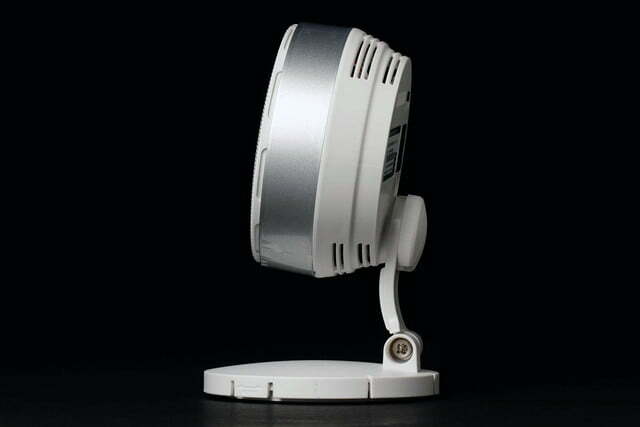 The SmartCam HD Pro isn’t perfect, but it solidly delivers on its main function of home monitoring. 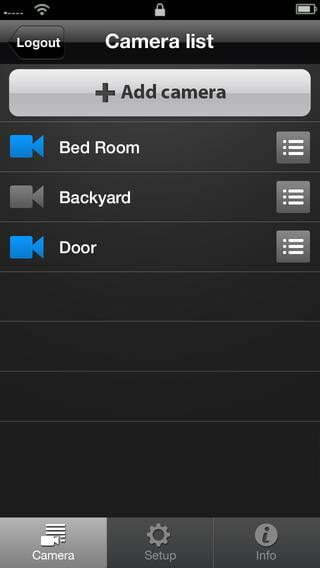 Home-monitoring webcams have been around for years, but to set one up often required some networking know-how. Over time, these surveillance webcams became cheaper and easier to set up, but it wasn’t until the arrival of the Dropcam that consumers took note. Why? Simply because the Dropcam is an affordable solution that’s easy to use, comes with useful features, delivers good picture quality, and takes the complicated networking out of the picture. 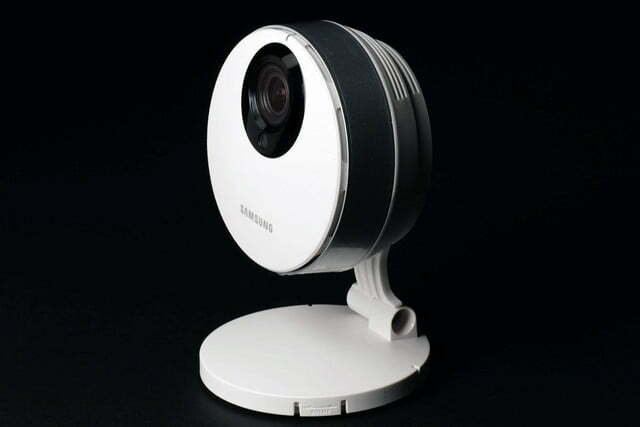 Samsung (via its Techwin division) has been making home-monitoring cams for some time, and just launched its own Dropcam competitor, the SmartCam HD Pro (SNH-P6410BN). It has several of the same features and ease-of-use as the Dropcam Pro, but one-ups it in areas like storage and resolution. 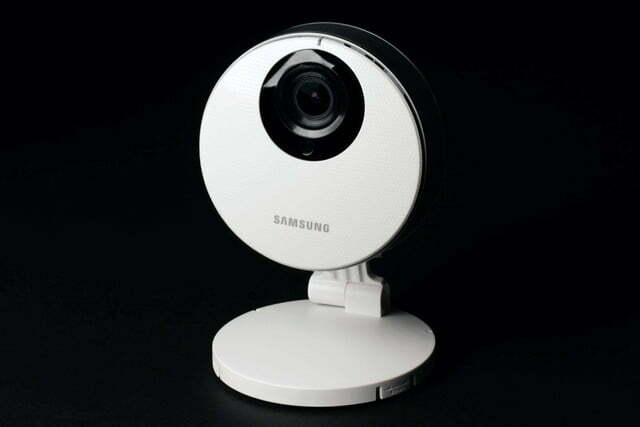 But as a home-monitoring product, can Samsung deliver a product that’s as consumer friendly? Yes, it can, and although it’s not a perfect product, it delivers as advertised. 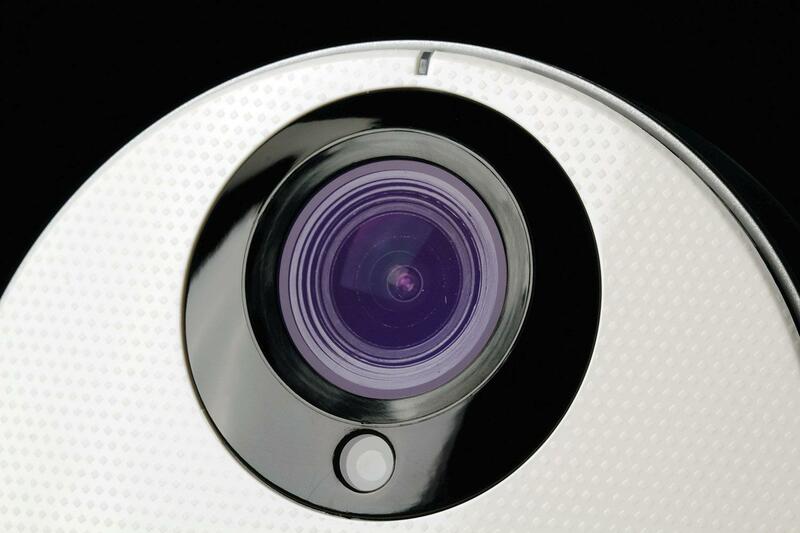 The SmartCam HD Pro ($190) is saucer-shaped 2-megapixel camera with an embedded lens that records Full HD (1,920 x 1,080, at 30 frames per second) video, as well as lower resolutions like 1,280 x 720 and 640 x 360. At 2 megapixels, you’re not going to be shooting high-quality stills with it, but video is really what you’re after. At 10 ounces, it’s relatively lightweight to adhere to the base to a wall (although you should also screw it in if you’re wall-mounting it, as we found out during testing); you could also just rest the camera on a tabletop. The camera is bit larger than the comparable Dropcam, and not as inconspicuous as we would have liked, but we have also seen cameras that are much larger. If you are looking for a discreet surveillance cam as a form of theft deterrent, you may not want the SmartCam to be your first choice, but for monitoring your family or pets, it’s a solid choice. The SmartCam isn’t cordless, and there’s no battery option, so you’ll need to make sure there’s an outlet nearby if you plan to move it around; the cord is relatively long, and there’s no need to set up the camera after each time you plug-and-unplug. Design wise, the SmartCam is relatively simple. 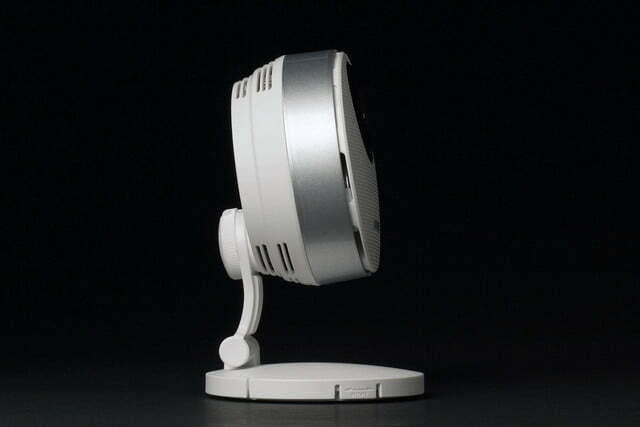 On the front you’ll find the camera lens, speaker (for bi-directional audio, or two-way talk), LED status light, and sensor to measure lighting conditions (the camera has a night-vision feature that works relatively well even in completely dark rooms). Beneath the unit is a Micro SD card slot that lets you record footage onto, while the back has a Wi-Fi Direct button (it creates a point-to-point connection between your smartphone and the camera, in order to set it up during first use), a reset button to bring the unit back to factory settings, Ethernet jack for a hard-wired connection (Wi-Fi is also available), audio-out jack, and microphone. Connecting the unit to external speakers might be cumbersome, but if you want to communicate to someone via the SmartCam, it’s a good idea as the onboard speakers aren’t very loud. As for the mic, Samsung strangely decided to put it on the back of the unit, which made it difficult to capture the voice of anyone talking back into the camera (more on this later). The design raises some questions, but it’s a sturdy little camera. However, you don’t really need to care what’s on or in the camera. While most people get apprehensive about things with “networking” in the name, this SmartCam is a easy plug-and-play affair. Once it’s powered up, you can set it up via your computer browser or iOS or Android device. Setting up with a computer is a bit more involved, as you’ll need to first physically connect the camera to your router in order for your computer to find it. 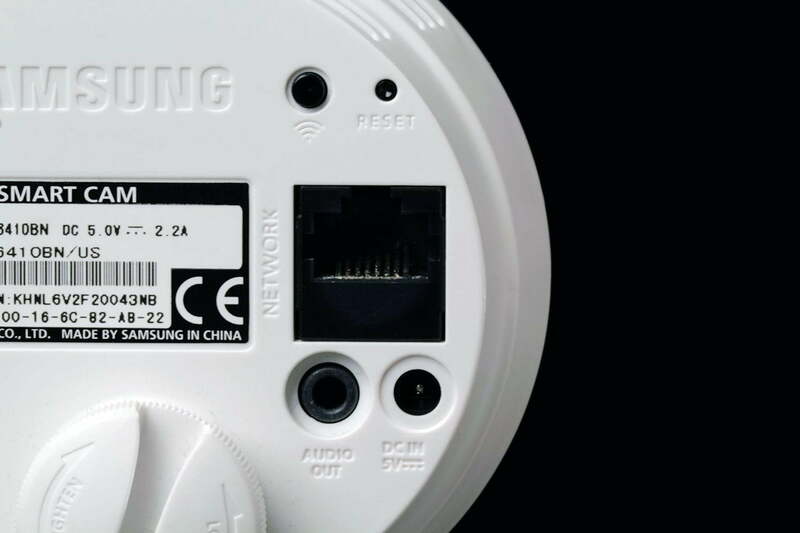 If you have a smartphone and your home is set up for Wi-Fi, bypass the computer and go straight to your iPhone, iPad, or whatever Android-based device you have, and set up the unit there (via the Samsung SmartCam app). This process is far quicker and painless, and you’ll have your SmartCam set up in no time. (Samsung’s has a series of videos on YouTube that demonstrate how to set up the camera and mobile app.) More on this in the “performance and use” section. The SmartCam offers many similar functions to the Dropcam Pro, although it one-ups its competitor (at least on paper) with the aforementioned Full HD video recording, SD card slot, and Ethernet port (if you require a hard-wire connection for stability). 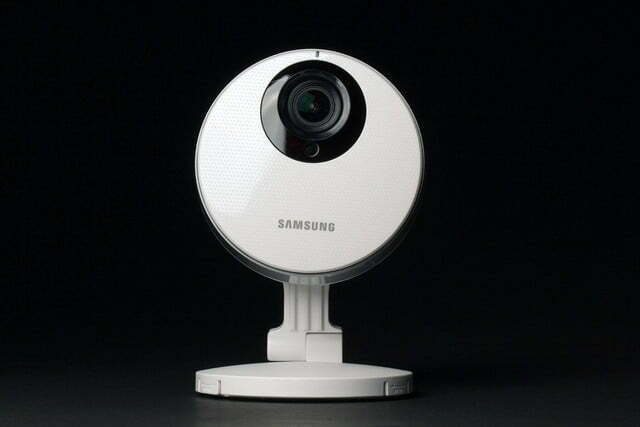 Otherwise it has a 128-degree wide-angle view (versus the Dropcam Pro’s 130 degrees), night vision (there’s also a Wide Dynamic Range feature, or backlight correction, that evens out the brightness due to strong lighting entering the room), motion detection, real-time alerts, digital zoom, and companion mobile apps. What the SmartCam lacks, that the Dropcam Pro has, are location awareness and scheduling; the SmartCam remains on at all times. Dropcam offers a cloud-based storage as an option. While Samsung doesn’t, you can have it snap a photo and send it to your Google Picasa account every time it detects motion. If you want to record video, pop a large-capacity SD card in there, and it can record footage continuously (erasing earlier recordings once it maxes out the card), or you can manually record a scene via the app. We think the SD card is a big selling point over the Dropcam, but if someone breaks into your home and steals the camera, then all your content will get stolen too. To view footage, or to make settings adjustments, you can either use a Web browser (Mac or PC) or the iOS or Android app. The menus are relatively straightforward and, except for a few features, are easy to figure out. We used both the iOS and Android apps, and found them to be exactly the same. 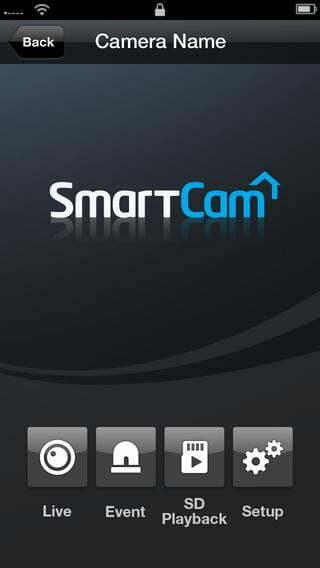 You will need to first create a Samsung SmartCam account, and then you can register the camera (or multiple cameras). Overall, we were able to get our test unit set up and running in no time. Whether it’s a Web browser, iPhone 5S, iPad, or Samsung Galaxy S5, we had no trouble logging into the camera and viewing footage. Now, let’s now take a look at how well it actually performed. The package comes with the camera, power adapter, network (Ethernet) cable, a quick-start guide and other documentation, double-sided tape, and screws and anchors. The full manual can be downloaded via the Samsung SmartCam website, but you don’t really need it unless you want to use some of the more advanced features. 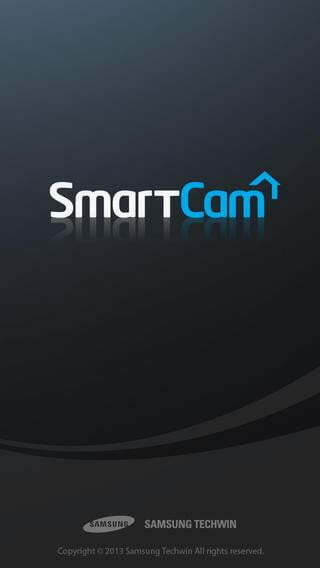 The SmartCam comes with a standard one-year warranty, but it doesn’t protect against accidents. 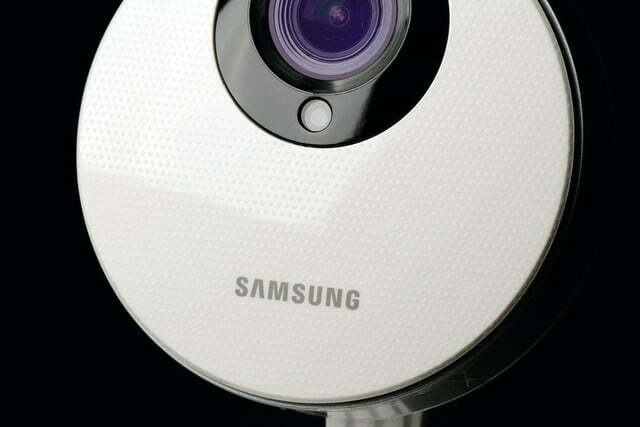 While Samsung’s SmartCam HD Pro isn’t perfectly designed, it manages to deliver on most of its promises as a home-monitoring device. The form factor and limited mounting options raise some questions, but it’s a sturdy little camera that capably beams live footage from your home (or wherever you’ve got it hooked up) to the computer, smartphone, or tablet screen of your choice. Overall performance is impressive, and image quality is very good with impressive low-light performance. 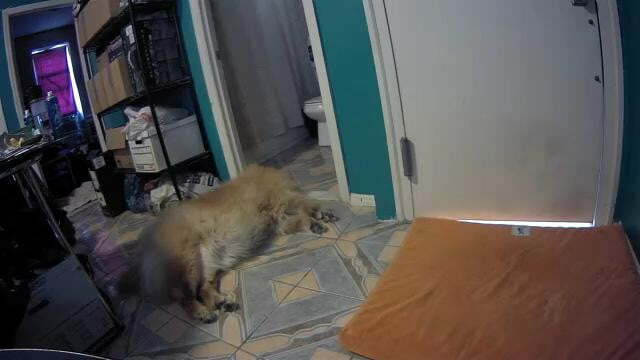 We tested the SmartCam in two different situations: one, as a surveillance camera to keep tabs on an apartment, and two, to observe a dog in another apartment while he’s home alone during the day. Other possible uses could be to observe your kids with their nanny or an elderly parent home alone, or record the happenings of a party you’re throwing. As mentioned, setup is a relatively smooth process, whether you’re using a PC, smartphone, or tablet. In both environments, we used our smartphones to handle the setup process because it’s much faster and less complicated. We simply plugged the camera in, created an account in the app, and followed the onscreen instructions to pair the camera. Simple. The camera’s overall performance is impressive, although we consistently saw choppy video whenever the stream was set to its highest video quality. This could be an issue with the bandwidth in your home or wherever you have it set up. 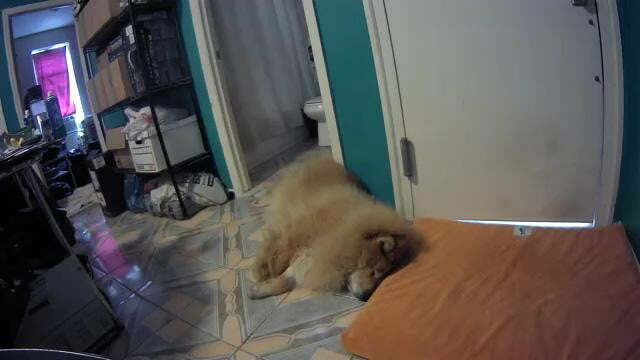 In observing our dog, turning off bandwidth-hogging devices on the camera’s local network helps, but we weren’t ever able to get a reliable HD video stream to work during this part of the testing. Lower quality settings work great, with only occasional video hiccups. In the apartment-surveillance environment, video performance is also generally great, except the few times where we couldn’t log in at all; we suspect it was an issue with the network, not the camera, since we were able to log in later. So, before we blame the camera entirely, we must also consider network speed as well. If you have a reliable and strong Internet connection, the camera should perform well. With that said, the wide-angle image quality is very good with nice coloring, and we were quite impressed by the low-light (or lack of light) night vision performance. Motion is also nice and smooth. Is it really true HD? Is it as good as cameras that have stronger sensors with more megapixels? No, but for viewing in small sizes on your computer or smartphone, it’s perfectly fine. For the most basic use – monitoring your home – it works really well if all you want to do is check on things. But there are more advanced features. The SmartCam Pro HD is equipped with features like night vision, zoom, and motion detection, all of which can be accessed using any of the Web or mobile apps. There are some inconsistencies, however. The two-way talk feature doesn’t seem to be accessible via the Web app, only the mobile app. Even on a laptop with a built-in microphone (we used a MacBook Air), there isn’t an option for speaking through the camera. We also found the sound quality to be low quality and sometimes difficult to hear, unless we shout loudly or there’s a noisy truck on the street. We do like a fun feature on the mobile app that lets you play music through the camera’s speakers, either to entertain a crying child (or, in our case, a sleepy dog) or to wake someone out of bed (or, again, a sleepy dog). 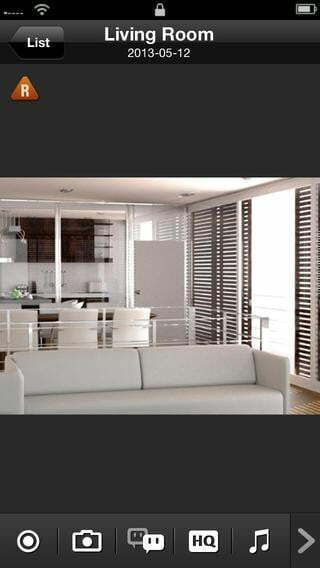 Another cool feature is that you can view through the camera from multiple devices simultaneously, without any hiccups. The motion detection also works well – almost too well. In our apartment surveillance test, we received an alert on our phone that something triggered the camera; sure enough, we caught a roommate digging through a change jar for laundry quarters. 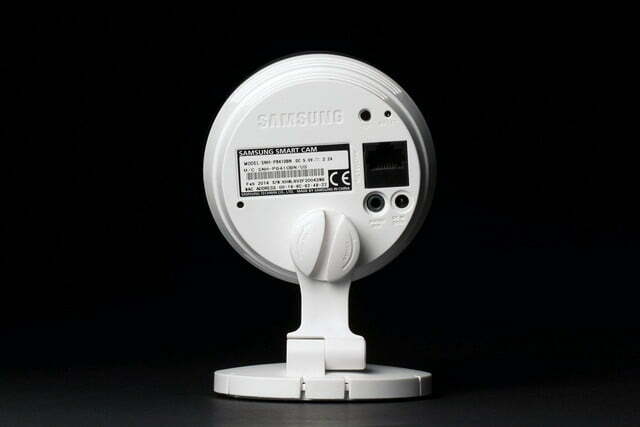 However, particularly at night, the sensor was so sensitive that it must have picked up the tiniest movements, like a curtain blowing or shadows moving across the room, because our phone blew up with alerts – enough to make you think someone is breaking into your home. A bigger problem is the SmartCam’s form factor. While overall it’s lightweight, it’s rather top-heavy, which causes it to tip over easily if it’s not secured to a surface. 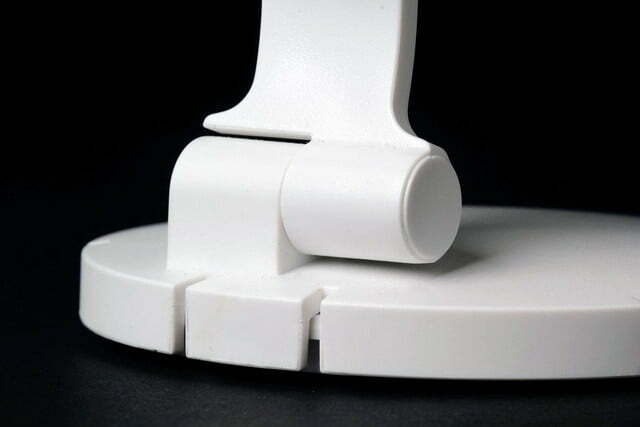 The included adhesive strip can be affixed to the base, and it provides stability when the camera is standing upright, but there’s no warning in the documentation that the adhesive isn’t strong enough to serve as a wall mount (screws are included for this setup). We learned this firsthand when the strip gave out and the camera fell to the floor; fortunately, the SmartCam is a sturdy little device. 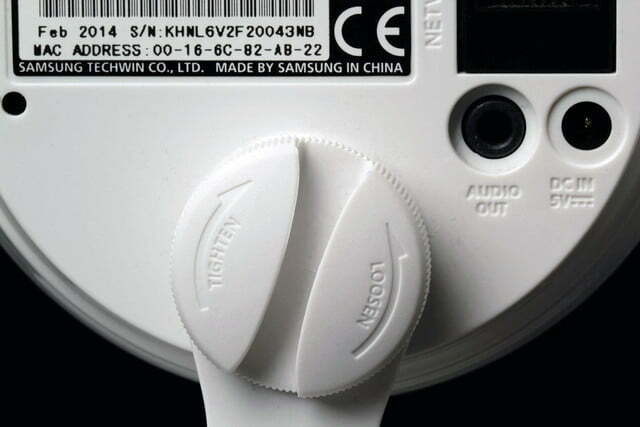 (We should note that Samsung includes screws and anchors for wall mounting.) No damage, internal or external, from the 5-foot fall onto a linoleum floor. 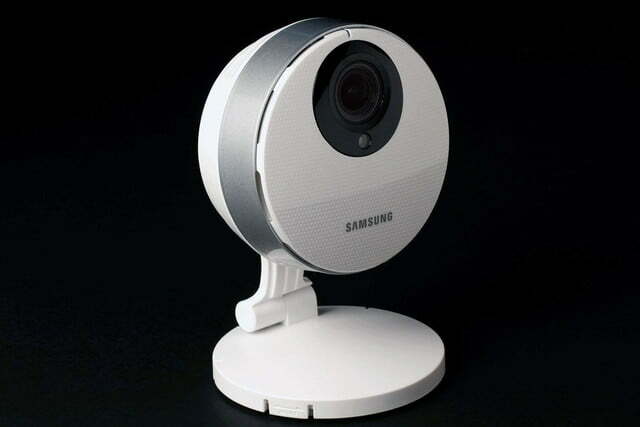 If you’ve got a pet or a young one that you’d like to have a live-feed of when you’re not at home, Samsung’s SmartCam HD Pro is a great option. The wide-angle lens captures a large chunk of the room than you might expect, and a built-in SD card slot even allows for video capture – a better option than for-pay cloud-based storage. If you need a true security surveillance camera, there are better (albeit more expensive) options with pan-tilt-swivel functions, but for the basic home monitoring needs or peace of mind, the SmartCam does the job. It’s not perfect, and – based on our time with it – the HD capabilities are mostly in-name-only, but the camera otherwise works as advertised, and comes with a robust feature package accessible through both Web and mobile apps.